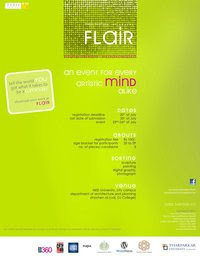 FLAIR - young artists extravaganza. Three Thirteen is a design Practice that emphasizes on developing inter-personal capacities of individuals through improvement in aesthetics and education. This time Three Thirteen introduces an event "FLAIR" in collaboration with Youth Affairs Department, Government of Sindh, to promote Young Artists. Be a luminary at design event " FLAIR", an event to provide platform for upcoming designers, visual artists and media students commencing on the 23rd and 24th of July 2011 at N.E.D University (City Campus - Architecture department). This event has been designed keeping in view the demand/s of young graduate Fashion designers, fine artists, communication designers, and media graduates and for those who don’t have any medium to display their creativity and skills before the masses. This event is strictly for youth and students so it shall provide neat and confident environment among students. It is an event for the revival of ethical values in apparel and visual, and performing art sense in youth. .Prints (size A3) of two well exposed images required for competition. .Images should be creative, and must define the youth efforts in any way. .No write-up on images are allowed i.e. name, or caption. Else image shall be disqualified.
. Caption or name are allowed on separate paper. Management decide to put on image or not.
. Must provide a e-copy of image/photograph in USB ,CD or e-mail us.
. Photo Essay and identical photography shall be entertained for exhibition. .Last date of submitting images is 20th July. .Management required 2 piece of calligraphy [Urdu (preferred) or Arabic]. In case of excess of entries one shall be entertained. .Management shall appreciate if any artist introduce new fonts or any experimental work. .Must provide a e-copy of calligraphy work (photography of art work) in USB, CD or e-mail us. .Last date of submitting form(s) and paintings is 20th July. .Damage or loss of any painting shall not be responsibility of administration if art pieces shall not be collected before 27th July, no excuses shall be accepted. .Management required two framed paintings from artist’s collection. Excess entries shall be entertain for exhibition(subject to availability of space and time). .Must provide a e-copy of painting (photography of art work) in USB, CD or e-mail us. Registration form available at Three Thirteen Coordination office. REGISTRATION FEE Rs. 100/- Only. Submit your "ART WORK" at Three Thirteen Coordination office. For further details and quires feel free to contact. +(92-21) 380-98550 |+ (92-21) 320-68996 |+(92- 333) 391-3407 |+(92- 321) 205-1558.